Leslie Model 120 | MOSweb Online! 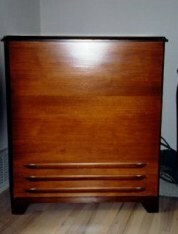 Single channel, single rotor cabinet driven off the organ’s internal amplifier. Image courtesy of – ?? ?